Since the mid-1970s an amazing philosopher has blazed across the philosophic sky—Stephen R. L. Clark. To date he has written twelve books, including From Athens to Jerusalem, Aristotle's Man, Animals and Their Moral Standing, Civil Peace and Sacred Order, God's World and the Great Awakening, The Mysteries of Religion, The Moral Status of Animals, The Nature of the Beast, and A Parliament of Souls, as well as dozens of articles. Critics find him "arresting," "profound," "amusing," and, paradoxically, "irritating." In this first critical work on Stephen Clark, Daniel Dombrowski provides a complete view of this intriguing philosopher and his work. Primarily, Clark's writing has focussed on three seemingly distinct philosophical spheres: philosophy of religion, the moral status of animals, and political philosophy. Unfortunately however, those familiar with one realm of his work, tend not to be familiar with what he has done in the other areas. To truly understand any one of Clark's specific concepts, one must comprehend the overlying philosophy that weaves them together. Dombrowski meticulously and critically assesses a wealth of important ideas and philosophical and theological topics to provide us with a firm grasp of Clark's ideas about God, animals, the environment, and politics. 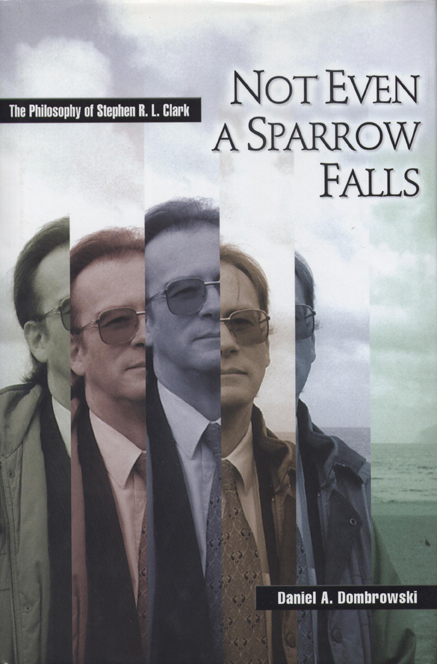 Not Even A Sparrow Falls also tackles the difficult problem of determining Clark's stance among the many ideas he presents with varying degrees of seriousness and with various rhetorical goals in mind, as expressed in The Moral Status of Animals: I am Aristotelian on Mondays and Wednesdays, a Pyrrhonian Sceptic on Tuesdays and Fridays, a Neo- Platonist on Thursdays and Saturdays and worship in the local Episcopalian church on Sundays. Daniel A. Dombrowski is Professor of Philosophy at Seattle University. He has authored more than ten books including: Hartshorne and the Metaphysics of Animal Rights, Christian Pacifism, Babies and Beasts: The Argument from Marginal Cases, and The Philosophy of Vegetarianism, which received a Choice Outstanding Academic Book Award.